Sarah Garland. 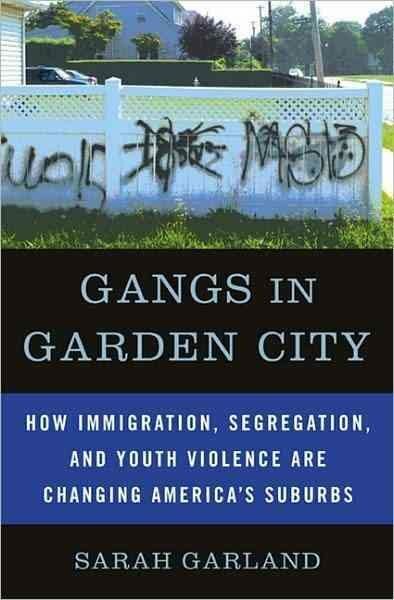 Gangs in Garden City: How Immigration, Segregation, and Youth Violence are Changing America’s Suburbs. New York, NY: Nation Books, 2009. Notes, index. Pp. 320. ISBN 1568584040. $26.95. Are there gangs in Garden City? Sarah Garland digs into the heart of Long Island’s suburbs to uncover the truth, the fact that gangs do not exist in Garden City, but exist in the decaying neighboring suburban community of Hempstead. Most Americans consider the gang problem as a “NIMBY” one (Not In My Backyard) – a pseudo existence in their lives, as gang life lives in the shadows of their worlds. Garland fosters five years of interview reporting into three extensive narratives. Three people agree to deconstruct their life stories and share their perspectives on how a pair of rival gangs, MS-13 and SWP, reputed to be the most ruthless in the world, thrive within the Latin American community and in neighborhoods unsuspecting of gang violence. Early in this book, Garland captures the attention of her readers by discussing the explosive saga of Mara Slavatrucha members stabbing 15-year-old Michael Alguiera on the handball court of Hempstead High School. Garland then unveils three youths whose lifestyles have been captured by the aura of gang life. Many young people look to gangs for protection, positive self-image and self-reassurance, as is evident with Julio, Daniel and Jessica, who reveal their discomforting stories of the “race” of gang life. By “race,” we suggest the homo-ethnic existence of their gangs—being exclusive of Latin American origin. We also imply “race” as the fast-moving, yet isolated style of the gang “hood”—members whose lives are segregated (voluntarily and involuntarily) from mainstream society. Daniel is a young boy who confided in the author that he felt a sense of pride being a non-immigrant in an immigrant gang. He spoke of the heightened sense of respect he gained for shooting a gun at an unexpecting victim and the awe he felt sitting in a meeting of mostly older gang members. The vulnerability of this young man to the influences and realities of gang life is real; Daniel knew the young boys who fell victim to gang attacks. The story of Julio is one of the immigrant struggle. Julio is a product of El Salvador’s Civil War, which he fought as a teenager-soldier. He immigrated to the United States to work as a day laborer, then later initiated into a violent street gang in Hempstead. Julio acted as a “go-between” for the two rival Salvadorean gangs, bravely organizing meetings between the two in an attempt to quell the violence in the streets. Julio considers himself to be as a victim of police abuses, and believes that law enforcement is not a solution but rather part of the gang problem, because they create the “existence” of gangs. Jessica’s story is of tribulation, an illiterate fifteen year old girl whose only success was her gang involvement. Her “cruel and fierce loyalty” won the approval of her gang leaders, earning a coveted role as “control(ler) of the females.” Her transformation later began while living with a family belonging to the Anabaptist sect, a very structured home life in which rules were not bent: no social media, no going out, and limited telephone calls. Ultimately, she entered a program called STRONG University where she served as a mentor, converting her helplessness into purpose. Garland also explores the political byproduct of combating gang activities evident during the implementation of the “No Child Left Behind” Act. This legislation linked the student achievement rate to the school district by holding districts accountable for the widening student achievement gap across ethnic groups and races. Garland reveals how a struggling Hempstead district began an overhaul through various measures such as decreasing the student-teacher ratio, and funneling gang members into nighttime concentrated “learning communities.” The graduation rate increased from 51 to 64 percent in 2007 (only 53 percent of the school’s Latinos graduated, however), and school social conditions temporarily improved with a decline in gang-related violence, but it was still unsatisfactory progress. The nearby affluent neighborhood of Garden City maintains a zero percent drop out rate. Although we would have liked to have seen a more extensive analysis than the author gives us of the possible link between academic performance and gang-related activities, Garland takes a unique approach by cross-comparing student performance between neighboring school districts. The author accomplishes this by linking federal school dollars and educational reforms in the fight to improve student performance in school. With the right mix, Garland argues, a district can beat the odds and improve the lives of students in the school and outside of it, by giving them the chance to get “themselves straight.” Garland does not stop here. The author cleverly argues that sometimes the criminal justice system appears to do too much. Iron-fist policies in dealing with the gang problem, suddenly relisted on the national agenda as a social problem as immigration has surfaced as a nationally-charged political issue, suggests that turning to a stricter law enforcement approach only contributes to the gang problem. Garland argues that such an approach fuels the fire of anti-immigrant rage in this country, while at the same time, holstering the effectiveness of social work programs such as intensive family therapy, designed to deal with the gang problem differently. Not only is the gang problem real, but efforts to decline or control its spreading influence requires embedding the solution within the social fabric of a rapidly changing American society.